Will the Bass turn up this weekend? The first set of Spring tides in May, has traditionally been my benchmark for the start of the Bass season. We normally see an influx of smaller Bass in the 2-3lb range, and reports from Kimmeridge and Ringstead indicate that some are starting to show. However, as I mentioned last week the bait fish have not arrived in numbers yet, so that may well delay the Bass. There are plenty of large Bass being caught by Commercial Bass boats towards the Isle of White and St Albans head. Personally I will be out trying for some Bass this weekend. At the early part of the season, I normally head towards Kimmeridge and Ringstead, but after being caught up in a landslip at Kimmeridge last year, I wont be going there again. I urge anyone to either avoid that area or take great care to not go under the cliffs. This year I will probably start off at the reefs around Sandsfoot Castle, as the Bass normally come in looking for Peeler Crabs. Fresh Peeler are without a doubt one of the best ways to target fish, other than by lure. If you want to find out how to find Peeler Crab and how to prepare them, then have a look at these couple of videos I produced. I am sure I don’t have to repeat it, but for those that may not know, you are not allowed to take any Bass until the 1st of July. One piece of good news is that the Mackerel are about in good numbers now. Reports from the tackle shop at Abbotsbury indicate that they are being caught in good numbers down that end of the beach. What’s not so good is the lack of Plaice. Don’t get me wrong, there are Plaice around on Chesil, but not as many as you would expect. As part of our new catch & cook series of videos, we decided to produce a filleting one. Gavin Parsons shows how to fillet a Pollock, but the same techniques can be used on most of the common white round fish in the UK. Portland: Small swell and lightly coloured water. Chesil Beach forecast: I can see the beach being busy this weekend with lots of anglers heading down to take advantage of the sunshine and the Mackerel shoals that are around. As I always say, the predators and larger fish follow the Mackerel in. Try a Mackerel head in very close for the chance of a huge fish. More Bass are caught at 10yds out on Chesil, than at any other distance combined. Although the Plaice are not around in huge numbers, they are worth targeting, especially at Abbotsbury. Another fish that often arrives at the same time as the main Mackerel run, are Gurnards. You don’t need huge casts to catch them and a two or three hook flapper is often the best rig. Bait it with strips of Mackerel or Ragworm. Portland: If the bait fish turn up this weekend, the Pollock fishing on Portland will be very good. Large tides, with high water that coincide a couple of hours either side of dawn and dusk, are perfect. As you probably know by now, my favourite method for catching Pollock and Wrasse is by lures. I will however try with a fly set up this weekend, if the wind allows. You can try float fishing for the Pollock and Wrasse. Both fish will take a float fished Ragworm, but Pollock prefer a strip of Mackerel. Portland Harbour: I have been complaining for weeks about the lack of fish in the harbour. Bass will feature if the bait fish show up. I know I keep banging on bout the bait fish, but if they are not there the other fish won’t be either. Peeler Crab will work in the harbour for Bass, but I will be targeting them on lures. Weymouth Bay: plenty of Mullet in the inner harbour, and the piers will produce Wrasse, Pollock and Pout. There is a good chance of mackerel on a float fished strip of mackerel or small metal lures. Feathering is prohibited from either of the piers. I am still convinced that there should be squid around the piers, especially at night. 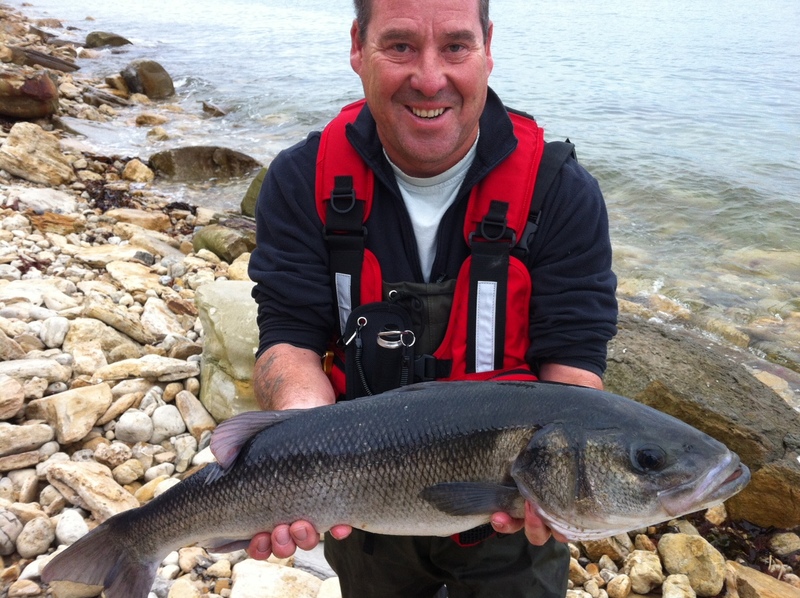 Fishing Tails > All Articles > Reports > Chesil Beach > Will the Bass turn up this weekend? 5 Responses to "Will the Bass turn up this weekend?" Thats fishing for you. There are plenty of Mackerel around, but not many bait fish, so that will have an effect on the Bass fishing. I am fishing SEATOWN Monday to Friday this coming week . i fished the low water on sat in the harbour not a single sign of any fish, and the tide was very high even though it was a spring, is this because of the amount of water trying to escape from the fleet , also i nearly got knocked off my feet by a man of war are these things dangerous ? No, it’s because it is a spring tide. During a spring tide the water comes in further and goes out further than on a normal or neap tide. During a neap tide, it is the opposite. There is very little tidal movement up or down. The jelly fish that you seen was most likely a Barrel Jelly fish, which can grow over 1m and are common at this time of year. They are not dangerous.